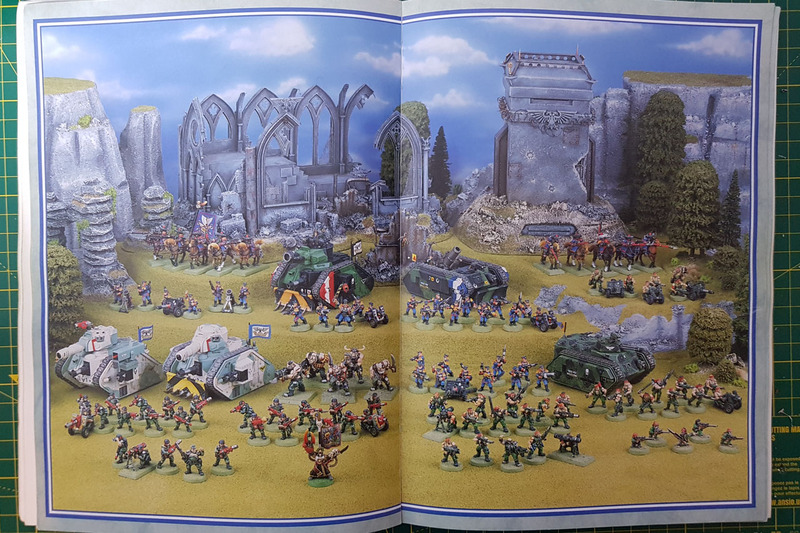 After the short introduction to Oldhammer earlier this month, we want to stick with the 2nd Edition of Warhammer 40,000 and highlight one particular army - the Imperial Guard. If you think of Warhammer, especially 40k, you think of Space Marines. But the Imperium and its forces is not only made of Adeptus Astartes, but simple men defending their homeworlds and holy Terra as well. The Imperial Guard existed in Rogue Trader as well and is not something new, that came along with the second edition. 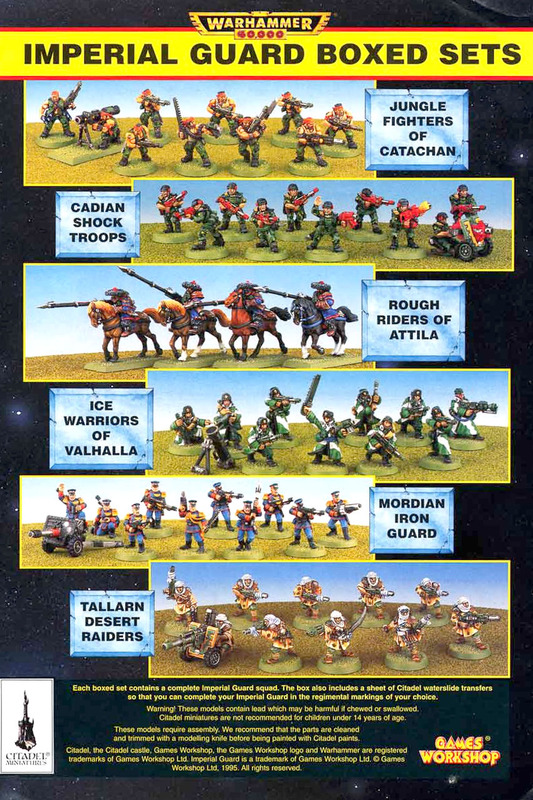 But the diversity was surely brought to that army with the new miniature range introduced in 1994. 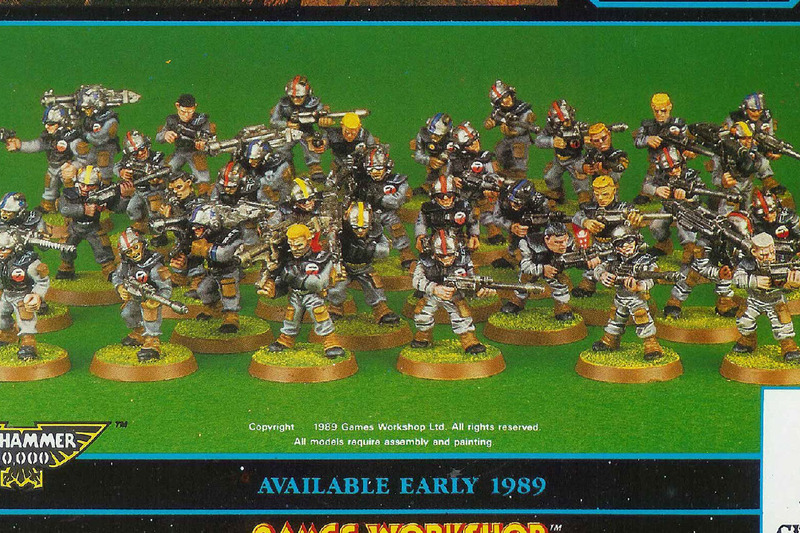 In the 80s and early 90s the range for the Imperial Guard in the Rogue Trader era wasn't that small. They already had their meta-human combatants in form of Ogryns and Ratlings. And most of the units like Rough Riders, Sentinels or Comissars were already part of the canon. They even had a plastic infantry kit in January 1989. But they didn't had the colourful regiments, that were introduced with the 2nd edition. 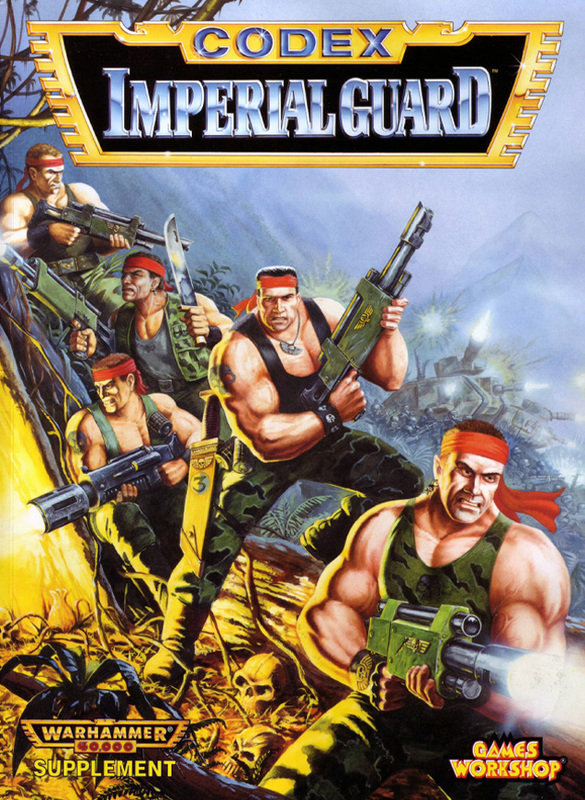 The Imperial Guard was more or less a rather generic sci-if mass army of humans, inspired by the books and movies of their time. They wore flak armour, with padded upper body armour and a helmet. That's it. The Imperial Guard of the 2. Edition had a bit more flavour, the army was drawn from more distinctive, different planets / homeworlds. They have very characteristic and well done sculpts by Michael (Cadians, Catachans, Tallarns & Mordians), and Alan Perry (Valhallans & Attilans). 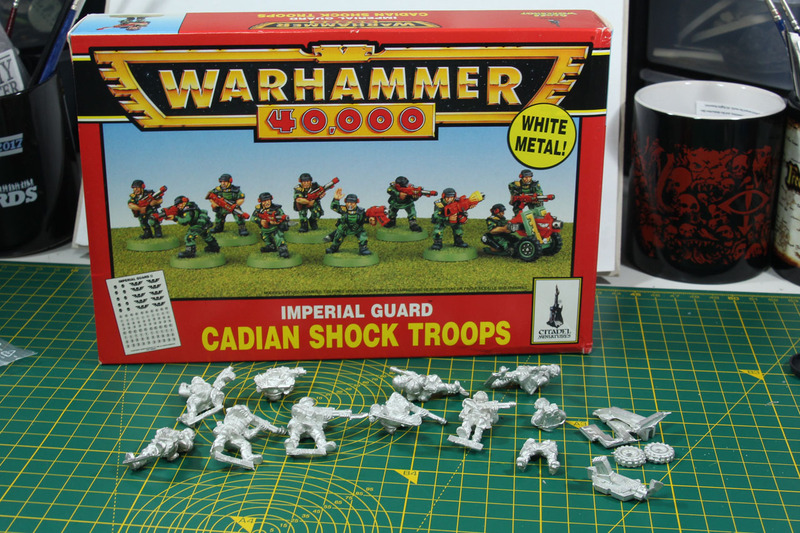 We have the further development of the old Imperial Guard design, the Cadian Shock Troopers, who still go on with the "generic" (not meant to contemn) sci-fi troops, that would fight Aliens on planets all over the Galaxy. Then there is a whole army of jungle fighting Rambos, the Catachan Jungle Fighters. The soviet-russian inspired Valhallan Ice Warriors with their heavy cloaks. The Mordian Iron Guard, that wears uniform similar to the parade uniform of the US Marines. The Desert Raiders of Tallarn, with their nomadic dress, capturing the vibe of Lawrence of Arabia. And the Attilan Rough Riders, kept in the style of the Mongolian golden horde. So quite a colourful and diverse range of miniatures. Another thing that was quite impressive and isn't even self-evident for today - the squad boxes had 10 different miniatures / poses. And in some cases you could get via blisters even more variety, and I'm not just speaking for the special weapons and heavy weapon teams, but for the regular grunts! And all of them painted in the bright colours of the "red period" or time of goblin green base rims. But the Imperial Guard was a demanding army back in the day. They did use a variation of the regular army organisation by percentage. You had to field platoons, consisting out of a command squad and added to these were 1 to 3 regular infantry squads. All the special or supporting units, like tanks, meta-humans or such, could only be used in addition to these. And if you stayed true to the rules, all units of a platoon had to belong to the same regiments. 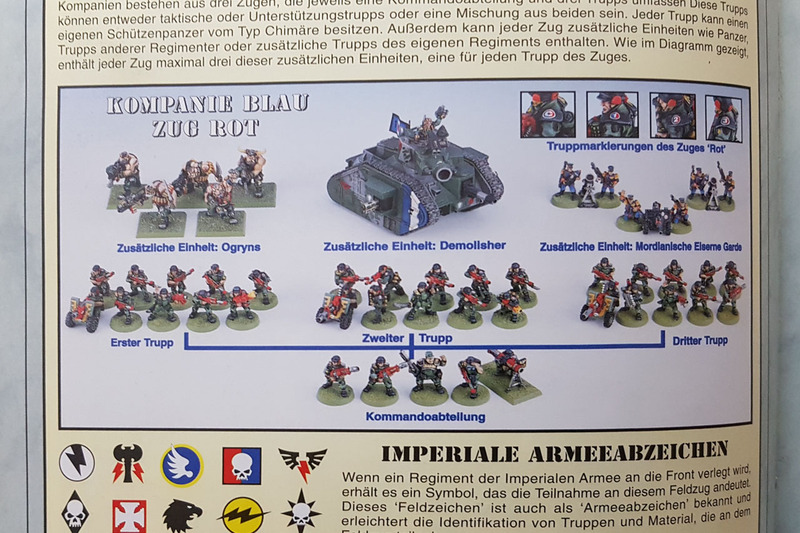 So if you wanted to use a squad of Tallarns with your Cadians, you had them either block a support slot or open up a new platoon, with a command squad etc. But this "fineprint" of the rules were often ignored, at least in house rules. As for the tanks, there were two main chassis that the Imperial Guard uses/d. The Leman Russ battle tank and the Chimera APC. There is a heavier variant of the Leman Russ, the Demolisher (and the exotic Exterminator, that was later not only available to the Space Wolves). The Chimera chassis was used for the heavier mortar tank Griffon, the self-propelled gun Basilisk and the flamer thrower tank Hellhound. This gives you a broad foundation to build your Imperial Guard on. As you do not only have "regular" human troops that you can paint in a paint theme of your liking, as most of every other army, but a couple of different, distinctive Regiments, that you can paint in different paint and camouflages, along with different vehicles and special units like the Ogryns, Ratlings and Rough Riders, who extend that variety even further. A couple of named characters of course and the chance to use some Allies. But more on that in upcoming posts. So a lot of reasons to be interested in this army as an Oldhammer project. In combination with the rather high price point due to the lots and lots of metal miniatures, this was something that just wasn't in my budget als a young teenager back in the 90s. 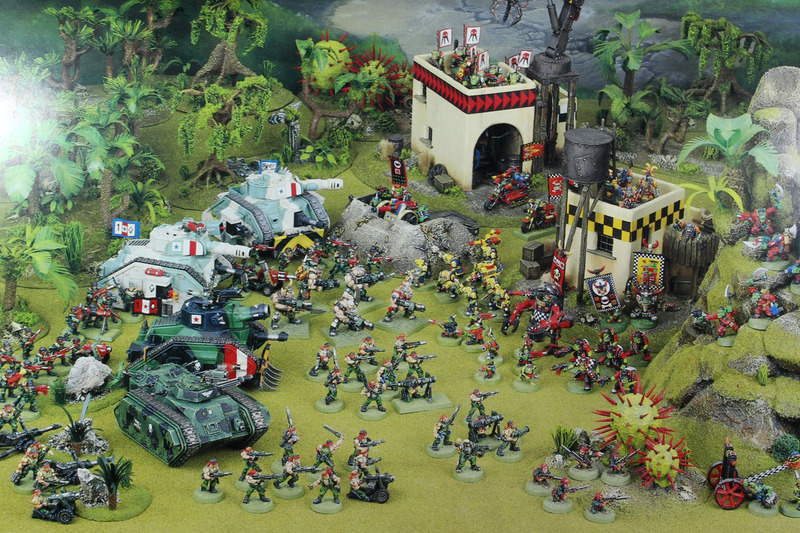 But with the stock that I already own of the Imperial Guard should be a manageable retro project. I'll have to do a stocktaking, to see what I'm missing to complete this and introduce the "rules" and further plans to continue this project. 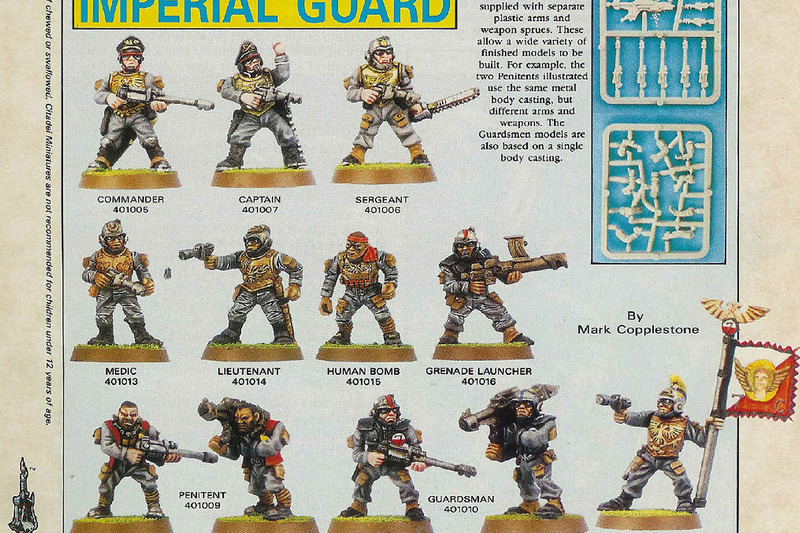 I hope this brief article gave you an insight on what the Imperial Guard was, before the broad introduction of plastic kits, Baneblades not scratchbuild or from Forge World, and why it was and is such an interesting army to collect. So get ready for some proper nostalgia in the next few weeks and months. Oh and the best part, I'm not alone on this mission! Great article! Never played Guard but I loved the models–the Ogryn in partcular. Those old plastics look so primitive in terms of design and molding. Has plastic production gotten more sophisticated or was GW just that primitive (cheap)? Those are 30 year old plastic models, of course the production has gotten way more sophisticated. Just look at the huge and detailled kits, that are possible nowadays.